He spent the winter of 1777-1778 at Valley Forge where he was almost involved with the Conway Cabal. 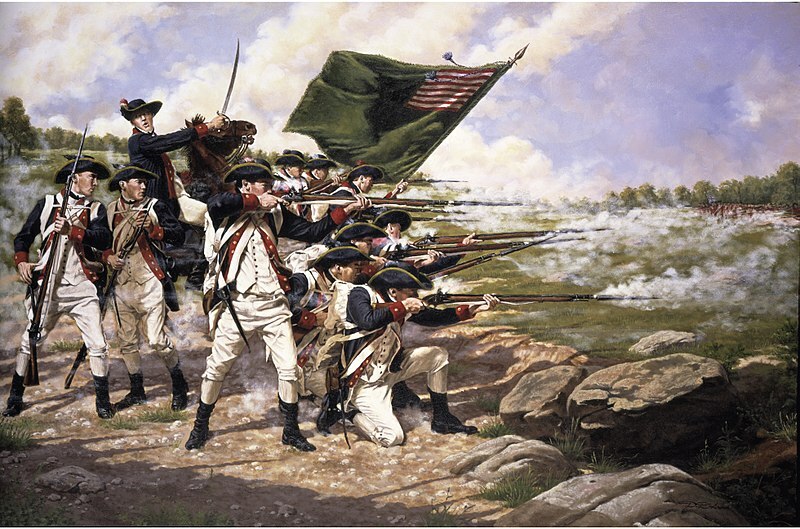 After evacuating with the army on June 19, 1778, he commanded a brigade during Monmouth. After the action there, he openly supported General Charles Lee — whom Washington had reprimanded upon finding him retreating from battle. 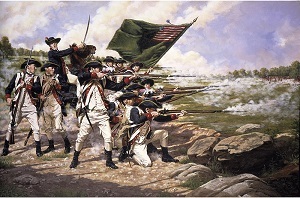 Burr commanded his regiment following the Monmouth Campaign in Westchester County, New York. 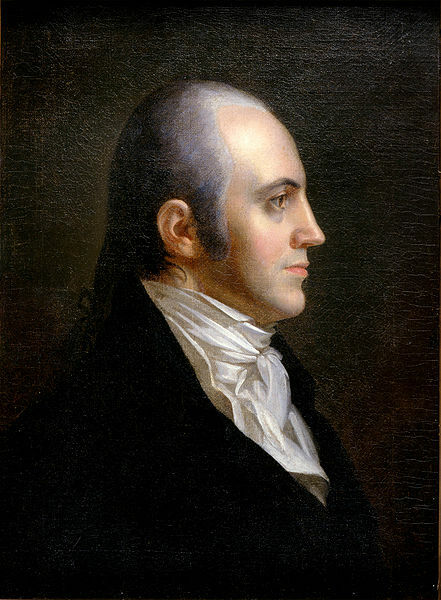 Aaron Burr resigned on March 3, 1779 citing ill health. By the fall of the following year, he resumed his career as a student of law. In 1782, he married Mrs. Theodosia Bartow Prevost, the widow of a British officer who was also ten years older than him. They had one daughter, Theodosia, in 1783, who subsequently died at sea in 1813. Aaron Burr and his wife were married for twelve years, when she passed away. Burr was a very successful attorney. He moved to New York in 1783 and shared a practice with Alexander Hamilton. 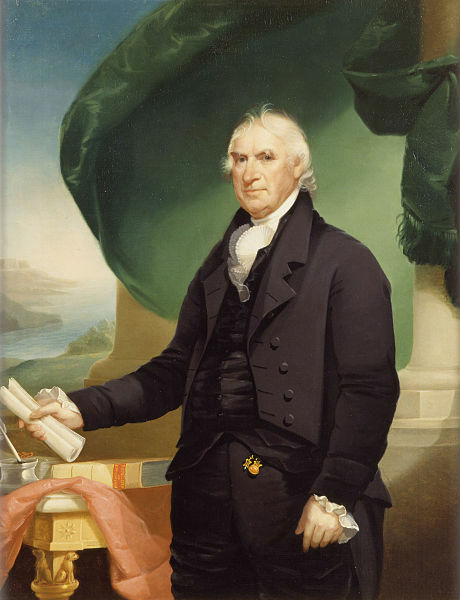 In 1789, New York Governor, George Clinton named him Attorney General, launching his political career. 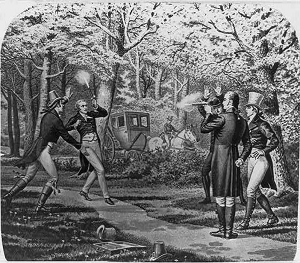 He was elected a U.S. senator in 1791, defeating incumbent General Philip Shuyler, who happened to be the father-in-law of Alexander Hamilton, which may well have contributed to the enmity between the two men, which was to later culminate in their famous duel. After one six-year term in the Senate, Burr ran for president in 1796 and again in 1800. Back then, a candidate for president did not campaign alongside a running-mate, who would serve as his vice-president if elected. Instead, each elector could cast two votes for any two candidates in the race, and whoever received the most votes became president, provided he received a majority, while the runner-up became vice-president, even if they were from opposing political parties. Burr came in fourth in 1796. John Adams was elected president, with Jefferson as Vice-President. By 1800, Adams' popularity had waned, as did support for his Federalist Party. This was the first election in which each party nominated a "ticket," with one candidate for president and another for vice-president, although the rules would not change until 1804 with the passage of the 12th Amendment, which decreed that electors would vote for the offices pf president and vice-president seperately. Jefferson and Burr, both members of the opposition Democratic-Republican party, tied for first place with 73 electoral votes each. The tie was broken by the House of Representatives, which selected Jefferson as President, Burr as Vice President. 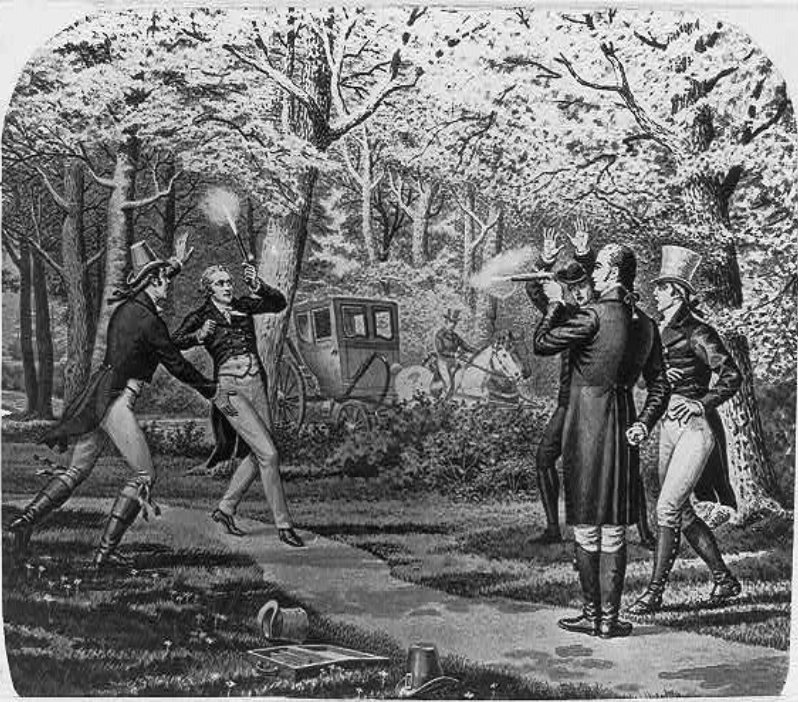 The Burr and Hamilton duel, 11 July, 1804, at Weehawken, N.J. In 1804, Burr ran for governor of New York, but lost by a large margin to Morgan Lewis. This, along with other setbacks, he blamed on Alexander Hamilton's political machinations. On July 11, 1804 — Burr and Hamilton met at ten paces at Weehawken. Both fired and Hamilton fell, mortally wounded. As far as history records, this is the only time a sitting vice-president shot and killed someone while in office. Burr continued to serve the reminder of his term as vice-president until March of 1805. Burr later was charged with treason in a conspiracy regarding capitalization on a possible war with Spain. He eventually was acquitted after a trial in 1807. He sailed to England in 1808 hoping to gain support for a revolution in Mexico. He was ordered out of the country and traveled in Europe to Sweden, Denmark, Germany and Paris. There he tried to garner support from Napoleon. This failed, leaving him so penniless he couldn't even travel home. He eventually sailed by French ship in 1811 but it was captured by the British and he was detained in England until May 1812. He finally returned to the United States to pursue his law practice back in New York. In 1833, he married again, this time to the widow of Stephen Jumel. When she realized her fortune was dwindling from her husband's land speculation, they separated after only four months. 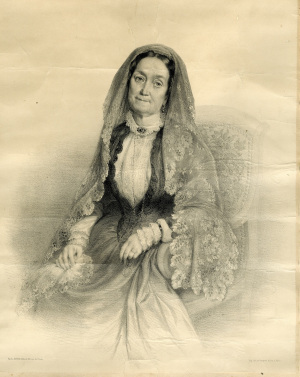 During the month of their first anniversary, she sued for divorce which was granted the day he died: September 14, 1836.